Do you create tables and graphs as part of your day-to-day work? Have you struggled with which visualization best communicates the data you’re working with? Have you encountered issues with what to do with missing values, data that spans wide ranges, or an overwhelming number of values? The University of Toronto’s Institutional Data Hub, a collaboration between the Planning & Budget Office and Enterprise Applications and Solutions Integration, is pleased to host one of the world’s foremost Data Visualization workshops on April 30 and May 1, 2019. Based on Stephen Few’s bestselling Show Me the Numbers: Designing Tables and Graphs to Enlighten, Nick Desbarats will take you through a two-day workshop on how to design graphs and charts that are quick and easy to understand. You’ll also learn how to make key insights within your data clear and accurate to minimize the risk of presenting misleading visualizations. This free workshop will consist of interactive presentation segments as well as eight group exercises and discussions that will be reinforced by examples. 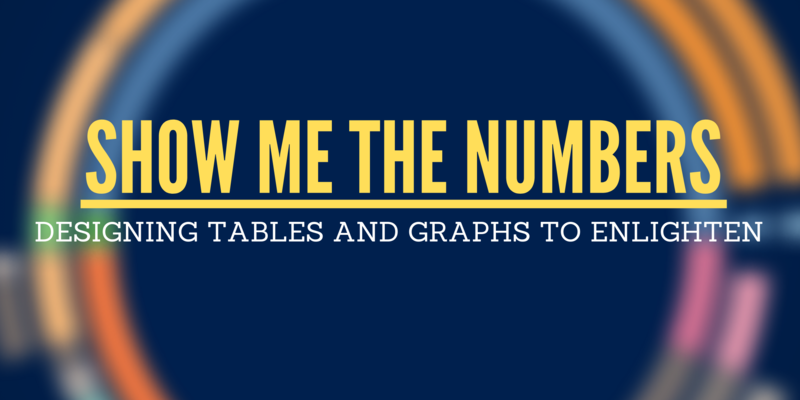 Upon completion of the workshop, each participant will receive a copy of Stephen Few’s book, Show Me the Numbers: Designing Tables and Graphs to Enlighten. For those unable to attend, you can borrow a copy from the Map & Data Library here – HA31.F49 2012Y. LOCATION: Ontario Institute for Studies in Education 5170-252 Bloor St West. Toronto, ON. M5S 1V6. PRESENTER: Nick Desbarats – Practical Reporting Inc.
To sign up for the waitlist, please click here – Password: showmethenumbers2019. Registration will be capped at 60 participants and attendees will be chosen on a first come, first served basis (multiple registrations from the same department might be limited to ensure broad representation across the university). Please contact us at data@utoronto.ca.